Amano TCX-22 Portable Time Clock. The TCX-22 works with any Side-Print style of time card. Perfect for locations where power is not available or practical. Time and Job Cost recording, choose model TCX-22 when intermittent power is a problem. Auto-Reset for Daylight Savings Time. The TCX-22 Employee Time Clock uses a Side-Print style of Time Card. Battery Operated Employeetime clock for new and small businesses. The Ni-CAD Battery provides Operational Power for time and punch recording. Battery Backup and battery will recharge when plugged into power. 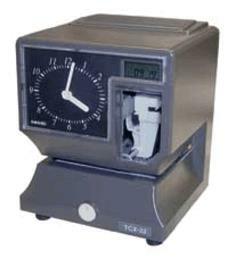 The TCX-22 Employee Time Clock is compatible with any Side-Print style time card.